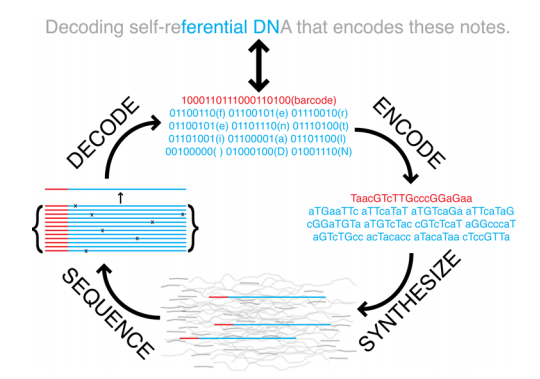 Reported in Science today, scientists George Church, Yuan Gao and Sriram Kosuri report that they have written a 5.27-megabit “book” in DNA – encoding far more digital data in DNA than has ever been achieved. Writing messages in DNA was first demonstrated in 1988, and the largest amount of data written in DNA previously was 7,920 bits. The challenge in writing more information than this has been creating long perfect sequences. The current project uses shorter sequences, each encoding 96-bit data block, along with a 19-bit address that specifies the location of the data block within the larger data set. Then redundancy reduces errors: each base only encodes a single bit (A and C are both “0”, G and T are both “one”), and each data block has several molecular copies. If we wish to intentionally use this technology for active long-term information storage (imagine some crucial message we need to convey to the future), we should probably anticipate the possibility of a discontinuity in technological knowledge and access to tools that could read the information. This raises questions of discoverability, decodability, and readability. Ubiquity aids discoverability – if the information is everywhere it is easier to find, even stumble upon, by accident. Still, clear signals / signposts could aid discovery (neon green cockroaches anyone?). With regard to decodability, I’ll simply mention there several layers of encoding to be unraveled here: spoken human language > written language in text form > digital / binary > DNA. And presumably readability requires tools on the order of at least what we have available today, unless you can make the expression of the information obvious in some biological way. Wonderfully exciting new stuff to conjure with from the perspective of technologies for the Long Now Library. We are also delighted to be working with Dr. George Church to provide Rosetta / PanLex data that may be written in a new “edition” of the DNA book, so check back for updates!